Police believe the seizure of a munitions and explosives haul in Kinawley, Co. Fermanagh two years ago has saved lives in Northern Ireland and seriously damaged the capability of a terrorist grouping. Various terrorist items seized including ammunition. • Forensic suits and gloves. At Antrim Crown Court on Tuesday, 45 year old Barry Petticrew of Swanlinbar, Co Cavan was sentenced to a total of 14 years after admitting possession of explosives, firearms and ammunition with intent and having articles for use in terrorism. Police confronted Petticrew in a rented, disused farmyard at Caldragh Road, Kinawley on October 8, 2014 while he was moving some of the items listed above. He tried to run several hundred yards across fields to the border with Co Cavan but was arrested. Detective Inspector Davy Lowans, from Serious Crime Branch, said: “This haul contained many of the components used by a terrorist grouping, everything from Timer Power Units and fertiliser to a coffee grinder, ammunition and forensic suits. 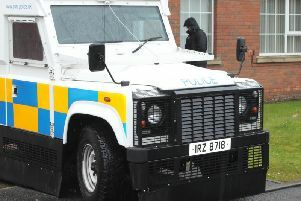 “We believe this was for use by dissident terrorists in Fermanagh and other parts of Northern Ireland. The quantities and range of items recovered would have enabled a number of explosive devices to be constructed. D.I. Lowans added: “We will continue to strive to strike a balance between providing an effective policing service which includes diminishing the threat posed by terrorist groupings and allowing normal community life to continue. We firmly believe that the removal of this terrorist haul has prevented bloodshed, loss of life and consequent heartache. We would continue to ask people to work with us and provide us with information so that Northern Ireland can be a safer place for everyone. Rubber gloves to provide forensic protection.